The UCLA Stein Eye Institute (SEI), established in 1966, is a comprehensive center vision campus dedicated to the preservation of vision and prevention of blindness through patient care, research and education. Our vision scientists are extending the boundaries of current knowledge and approaching the goal for a lifetime of good vision for everyone, due in large part to a strong tradition of philanthropy from private sources. Contributions from individuals, corporations, and foundations provide the SEI faculty with the resources necessary to consistently record noteworthy achievements in research, education and innovative patient care. The Stein Eye Institute offers a variety of giving options to those who wish to contribute to this tradition of excellence via direct donation, major gifts, endowments and planned giving. 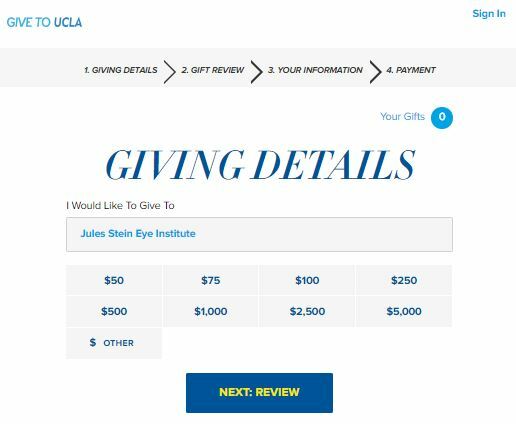 You can give directly to the UCLA Stein Eye Institute by entering your information on this downloadable donation form and mail it with your contribution directly to the Stein Eye Institute. Your gift to UCLA Stein Eye Institute is a gift of sight. Every year, millions of people are diagnosed with debilitating eye diseases and every year, extraordinary breakthroughs in diagnosis and treatment of these diseases are made here. We accomplish our mission to preserve sight and prevent blindness by extending the scientific projects and humanistic programs that best serve the community and contribute to the advancement of ophthalmology worldwide. The caliber and dedication of our faculty, students and staff are one contribution to our great work. Other accomplishments stem from our advances, community outreach, and the ongoing commitment of many philanthropic friends. Your support of excellence in vision science at UCLA Stein Eye Institute today is an investment in sight for so many now and in the future. Gifts may also be unrestricted in nature. When you do not restrict the use of your gift, the Institute gains flexibility not otherwise available. Unrestricted gifts can be used at the discretion of the director to meet changing or urgent needs such as top faculty recruitment, state-of-the-art technology and equipment or new research initiatives. Please select the Jules Stein Eye Institute Fund category online for your unrestricted donation to help meet the Institute's greatest needs. Follow the below steps to make an online donation with your credit card or PayPal account. You can make a one-time, recurring, or pledge directly to the UCLA Stein Eye Institute. 1. Click on "Giving Details" to select a fixed donation amount, or enter a different amount by selecting "OTHER." 2. Then click on the “NEXT: REVIEW” button to complete your donation. Follow the prompts on subsequent pages to continue with your personal information to complete your donation. Gifts of support to the Institute may include gifts of cash, securities or other property, and gift pledges. For more information on the various ways to donate, please contact our Development Office at (310) 206-6035. A major gift to the Stein Eye Institute is an investment in the future for millions of people who suffer from debilitating eye disease. The Institute accomplishes its mission to preserve sight and prevent blindness by extending the scientific projects and humanistic programs that best serve the community and contribute to the advancement of ophthalmology worldwide. A gift of an endowment demonstrates a long-term commitment to the Stein Eye Institute, since the fund is maintained in perpetuity. A portion of the annual investment income is used to support clinician and scientific initiatives and the remaining investment yield is returned to principal; thus, over the years, the fund can grow and provide continuous support. An endowment serves as an enduring legacy as it can bear the donors name, or can honor a loved one. These funds can be made payable for up to five years. Giving opportunities exist for endowed chairs; endowed fellowships; and endowed funds for research, education and patient care. However you choose to support JSEI, you will be embarking on a partnership with one of the world's preeminent eye research centers. Such an investment will greatly expand our understanding of the causes of eye diseases, expose alternative treatment options, and ultimately prevent blindness. A planned gift demonstrates foresight in a lasting commitment to the Institute. Planned gifts are gift arrangements that have specific tax advantages and often include lifetime income to a beneficiary or beneficiaries named by the donor. Many SEI donors have utilized planned giving methods and are enjoying benefits today such as capital gains and income tax savings, to name a few. A planned gift maximizes your giving potential and can even allow you to ensure your future financial security or that of a loved one. The value of a bequest to Jules Stein Eye Institute is deductible for estate tax purposes, and there is no limit on the amount of the deduction. However you choose to support SEI, you will be embarking on a partnership with one of the world's preeminent eye research institutes. Your gift can make the difference in the work of a distinguished faculty scholar, our clinical or educational programs, or one of SEI's cutting-edge research programs. All gifts made payable to Stein Eye Institute are tax-deductible in accordance with the Internal Revenue Code.